Q: What exactly has the EU agreed? and Greece, which are already receiving bailouts. Q: Why does this matter so much? first, leaving little for bondholders. A: Not so fast, hang on there a minute. dependent on the EU/IMF for the foreseeable future. discreet silence on the subject. efforts to cut the bailout interest rate are hitting a brick wall. Q: What does the IMF make of all this? failure to sort out the Greek mess. point out the Euro is gaining strength against the dollar, temporally yes! value as long as this status is maintained . another 30 Billion next year and the year after! three years you would think the politicians would now come out and tell the truth. Queen Visits Ireland; All Is Forgiven? Dominant Social Theme: This good and gracious lady has trod the green sod. Let the healing begin. Ultimately, all nations are one and the same. Let us overcome divisions and strive for globalism. Free-Market Analysis: It really is too bad. Ireland, with only five million Irish remaining in it, has been virtually eviscerated by the European Union and its globalist financial strategies. To tempt the Irish to join the EU, a good deal of money was spread around liberally; Irish elites were basically bribed and Irish citizens were subject to an immense propaganda campaign based on the idea that the EU would provide increased prosperity forever. Of course it hasn’t worked out that way. 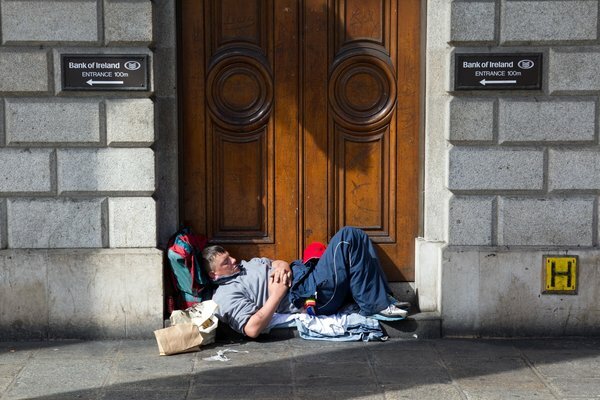 The world economy crashed and Ireland, predictably, along with it. Now the Irish face years of so-called austerity as the International Monetary Fund in cahoots with Brussels’ Eurocrats has lent Ireland the money it needs but only if the Irish pay more taxes, reduce government services and sell off national assets. Yet, these are internal matters and remedies should not be imposed on Ireland as they have been. The result: increasingly compromised sovereignty and yet one more step toward global governance. This latter conclusion is somewhat laughable to us. The Queen is the wealthiest woman in the world, worth nominally some US$50 trillion as she has title to vast tracks in various Commonwealth Countries. Of course what she can actually dispose of is more mundane; arguably she owns much of her assets in name only, but own them she does, or so it is reported. The ring of steel comment is perhaps not laughable but certainly ironic. As is increasingly the norm in Europe, the official dialogue diverges from the “reality on the ground.” Despite the determination of the mainstream press not to report on them, there have been demonstrations, especially in Dublin. And empty streets, bereft of well-wishers, speak volumes about the lagging Irish enthusiasm for this event. The Queen can dress up in as many bright dresses as she wishes, but these do not obscure the violent history of Ireland nor its current difficulties. We are not sure why Britain or the House of Windsor chose this moment in time to make such a symbolic trip. The story is a simple one; she was invited and therefore she came. But perhaps with the EU foundering and Britain itself facing various economic difficulties, the powers-that-be needed a diversion. Conclusion: Here is another supposition. Coming on the back of the Royal Wedding, the Queen’s visit was perhaps to provide a twofer of power elite positive publicity. Instead it may mark a further awakening of Irish resistance to the phony austerity under which the nation currently suffers. The Chatham home of disgraced Irish banker David Drumm is on the market for $5.5 million. Cape Cod Times/Christine Hochkeppel By Sarah Shemkus sshemkus@capecodonline.com March 05, 2011 BOSTON — Disgraced Irish bank chief and sometime Chatham resident David Drumm won’t be allowed to bill his former employer and largest creditor — Anglo Irish Bank — for his time and legal fees as his bankruptcy proceedings continue. Judge Frank Bailey denied a request by Drumm’s attorney, Heather Zelevinsky, that Anglo Irish compensate her client for the legal fees and lost wages he would incur from further participation in what she called the “almost neverending discovery process.” In February, Drumm gave a six-hour deposition to Anglo Irish attorneys. “It is burdensome on the debtor to appear before Anglo Irish for this prolonged discovery,” Zelevinsky argued Friday in U.S. Bankruptcy Court. Bailey disagreed. “He selected this forum and he’s going to submit himself to examination at his own cost,” the judge said. A request of this kind is “highly unusual,” said Alex Rodolakis, a Hyannis-based attorney with expertise in bankruptcy procedure. “I am not aware of any circumstance in which an individual debtor has been compensated for their time related to their own bankruptcy case,” he said. Drumm’s case continues to unfold. Bailey ruled Drumm will have to submit to further questioning by lawyers for Anglo Irish and turn over documents relating to an investigation by Irish regulators into his actions as CEO of the bank. The hearing, which Drumm did not attend, was part of ongoing proceedings related to his bankruptcy filing. “We’re here to offer a fresh start for debtors, but part of that is disclosure,” Bailey said during his ruling. Drumm was chief executive of Anglo Irish when scandals first broke concerning the bank’s lending and accounting practices. Drumm resigned his position in December 2008, one month before the Irish government took control of the bank. Shortly thereafter, Drumm and his family moved to a home they own on Stage Neck Road in Chatham. They have since moved to Wellesley but still own the Chatham home, which is on the market for $5.5 million. Drumm has steadfastly refused to return to Ireland to participate in legal proceedings and investigations regarding his role in the collapse of Anglo Irish. The bank has sued him for 8 million euros — $11.2 million — though that case was automatically suspended when Drumm filed for bankrupcty protection in U.S. courts in October. In December, Ireland’s Chartered Accountants Regulatory Board declared that its investigations had found reason to believe a case exists against Drumm regarding questionable loan transactions made during his tenure as CEO. It is the report of this investigation and the written information Drumm provided as part of that process that Anglo Irish attorney’s were granted access to in Friday’s ruling. “It is certainly the bank’s position that these documents are highly relevant,” said the bank’s attorney, Kenneth Leonetti. The documents, he said, would contain information about the possibility that Drumm had knowledge of 10 million euros ($14 million) in loans made to key customers for the purpose of buying shares in Anglo Irish. The documents might also shed light on whether Drumm was involved in changing the terms of some of these loans and whether he was involved in moving some loans off the books to make the bank’s financial condition look stronger than it actually was, Leonetti said. “Frankly, we’re skeptical of some of the things the debtor said at his deposition on these topics,” Leonetti said, labelling some of the comments Drumm has made as “fantastical stories.” Zevelinksy claimed concerns have been raised over whether the report is accurate, saying that some observers believe its contents to be “strictly political” and riddled with factual errors. “It didn’t seem relevant for us to produce it,” she said. “We’re on a wild goose chase here.” Drumm’s creditors have until March 18 to object to the banker being declared bankrupt. Anglo Irish is still deciding whether to file a challenge, Leonetti told the court. Zelevinsky said she considers it very likely that the bank will object. This is just showing the Irish people how arrogant this gob**** is ,he and the rest of the gangsters from the banks should be in jail!